Level Rewards is by far the best free affiliate marketing system available online today, it’s one of the best FREE income opportunities available online. 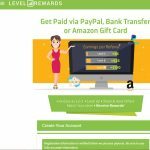 Level Rewards is an exciting new online company that markets incentivized offers. This means network advertisers can draw in many new customers which will earn rewards for those involved in referring others for free using affiliate marketing. “Level Rewards” offers allow for referral commissions as well. Users engage in product trials with the incentive that they can receive commission for anyone that they refer by way of levels and leveling up. Referral offers usually pay a lot higher than Get Paid To, or GPT, offers, which is why Level Rewards promotes referral commissions instead of direct incentive offers. The Level Rewards service is free to join with no monthly fees ever and you get to make money right away without having to spend anything at all. You could level up, refer someone today that levels up and get paid right after with PayPal or bank deposit. There are plenty of free offers you can do to level up quickly. It’s so easy to refer users with the Level Rewards referral system because there is no cost to join this. There is plenty of training you can find on YouTube on how to get people to your referral link. Level Rewards also provides training in it’s back office as well. The way Level Rewards works is though a system that has you complete levels which are worth $5 per level a referral of yours achieves. The maximum a member can earn per referral is based on their current level. Every 1.00 credit elevates you to the next level and partial credits are added up to hit the next level. So if you complete an offer worth 1.25 credits, you will be at level 1. If you complete another offer for 0.75 credits, you will have 2.00 credits total and be at level 2, enabling you to earn up to $10 ($5 per level). As an example, if you signup, complete offers and get to level 5, it will enable you to earn up to $25 per referral. So if you sign someone up in Level Rewards and they get to level 1, you’ll earn $5. If you sign up a different member and they get to level 3, you will earn $15 in rewards. If that person comes back and completes 2 more levels (even if it’s months later), you will earn an additional $10. If they then go to level 10 and you are still at level 5, you cannot get paid out for the levels that they completed above your level, until you raise your level, then you would get paid for all the levels you weren’t at prior. This way you never miss out on any money. If someone you refer goes to a higher level than you, you simply level up to get those commissions. In reality, a person who gets to level 10 (who can earn up to $50 per referral) will have some members who get to level 5, others who get to level 1, others who get to level 10, etc. Increasing your level raises your income potential, but how much you earn per referral will vary. Typically, the more you help your referrals and the better relationship you build with them, the more levels they will complete and the more you will earn. I suggest getting to at least Level 5 as soon as you can because most are going to be at Level 5 through Level 10 pretty quickly after joining. Make sure you check out the FAQ section as soon as you get to the site. I highly recommend joining Level Rewards! It’s a great way to make money online from home.